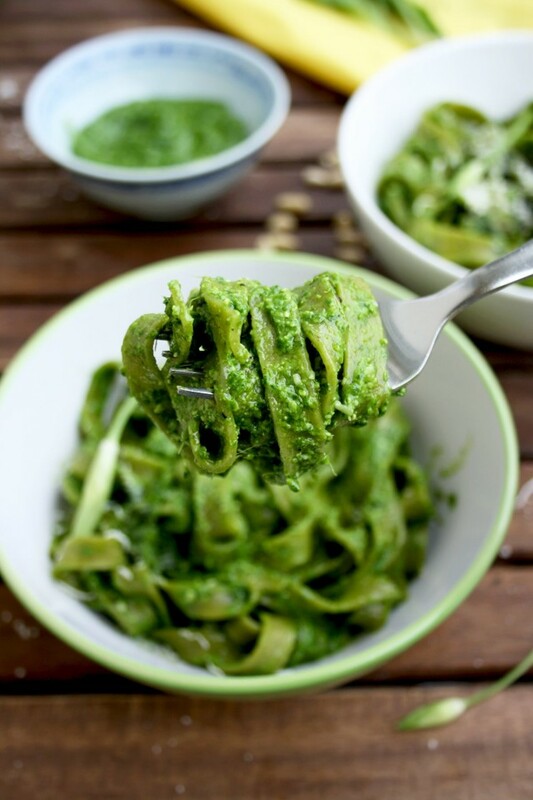 Easy Green Pesto Pasta with Wild Garlic: Quick and healthy vegetarian (or vegan) dinner full of spring flavors ready in just 10 minutes with 4 ingredients! 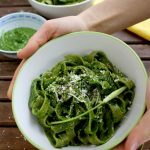 This easy green pesto pasta is what I’ve been eating for the last days, while my kitchen was being (and still is!) renovated. It’s the easiest dinner ever invented. If you are looking for something that takes no more than 7 minutes to make (that’s for how long my fresh pasta has to be boiled), this recipe is for you. I mean, there is nothing easier than that. 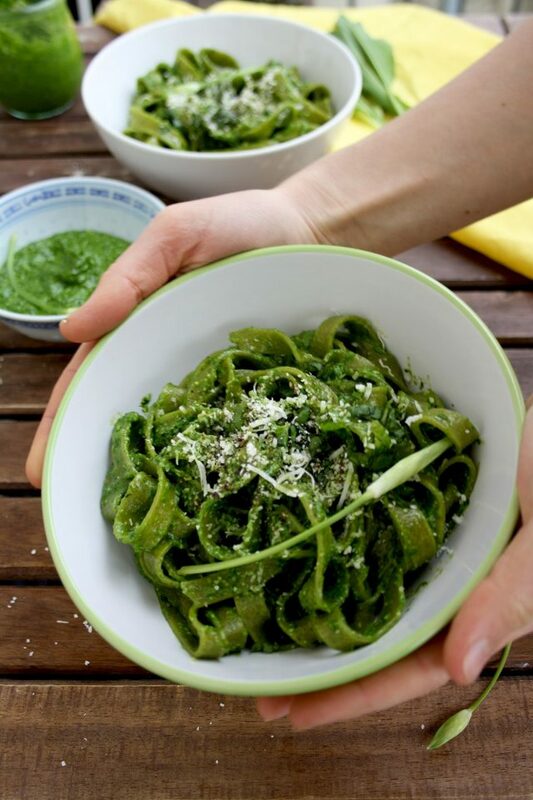 Boil your pasta, add some wild garlic pesto, grated Parmesan or any other hard cheese, a splash of olive oil, garnish with chopped wild garlic or basil, sprinkle with salt and freshly ground black pepper and you are ready to go. 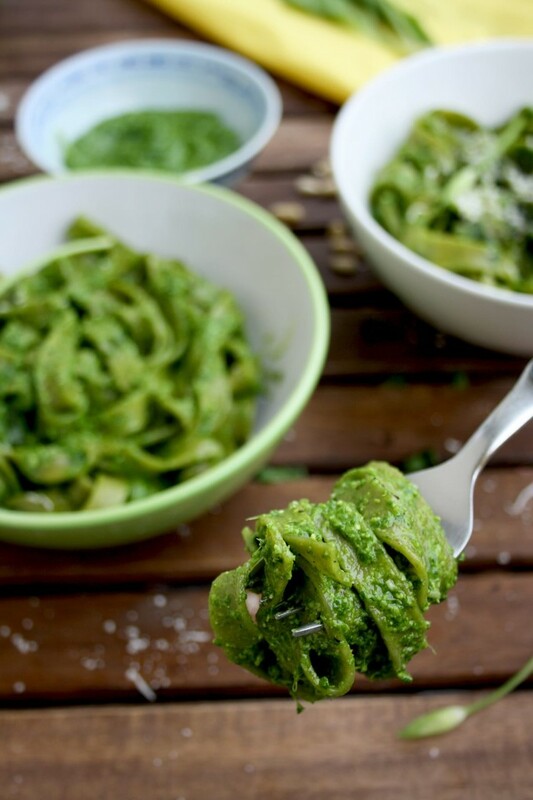 The same recipe would work well with kale pesto, or pretty much any other pesto you have at hand. Omit the cheese, add some ground nuts and you have a vegan dish. It’s full of flavor and it’s ready within minutes. It’s a perfect dinner for those who have a temporary kitchen corner arranged in the living room. I can’t wait to see my new kitchen when it arrives. And I’m looking forward to make a bunch of new recipes and share them with you! I try to keep my blogging pace but it’s a bit hard with the ongoing renovations and my past birthday weekend. I mostly spend time outside, as the spring finally came and the weather is great! I had my dream birthday at an amusement park, and we spent the weekend grilling, fishing, riding bikes, eating ice cream and enjoying the sunny days. I couldn’t wish for more for my birthday! I had three days of fun and it was definitely a pause I needed to take. Now I’m ready to dig into the renovations, my blog routine and my small balcony garden. I will post pictures of my kitchen before and after, when it’s ready, so stay tuned! I have some really important news for you! I launched a weekly newsletter exclusively for my email subscribers! Sign up and get my FREE e-book and a free subscription to my newsletter. You will receive it every Wednesday straight to your inbox. 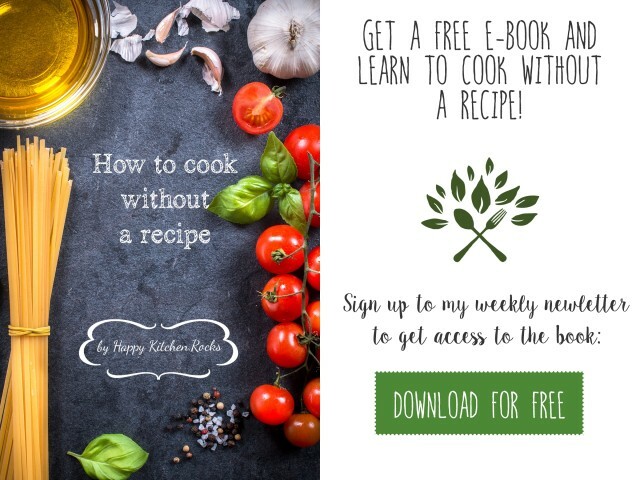 It’s a great way to stay connected and not miss new recipes! 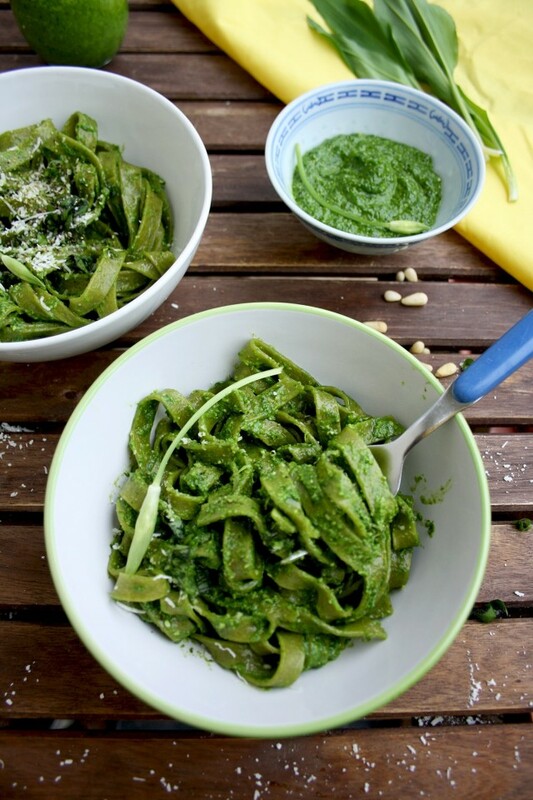 Back to the recipe of this easy green pesto pasta, as I said, there is nothing simpler than that. 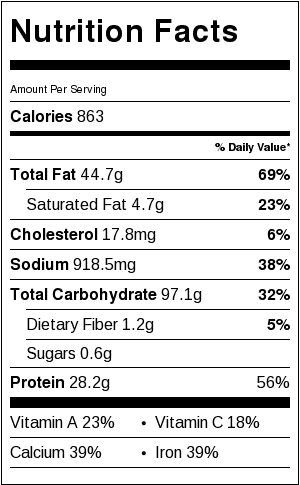 If you want to make it healthy as well, opt for the whole grain pasta. 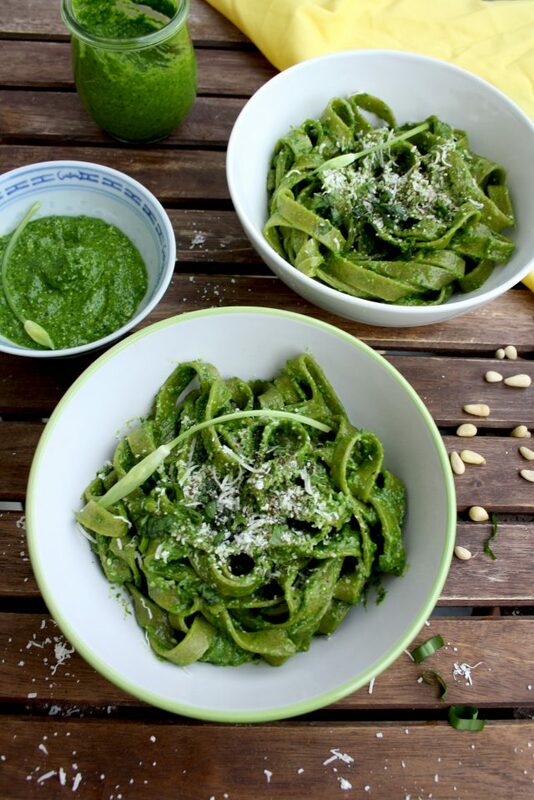 I had fresh spinach-infused whole grain tagliatelle, that takes the least time to make and looks nice. You can take any pasta you want though: fusilli, rotini, penne, spaghetti, etc. Feel free to use any pesto you like/have as well. 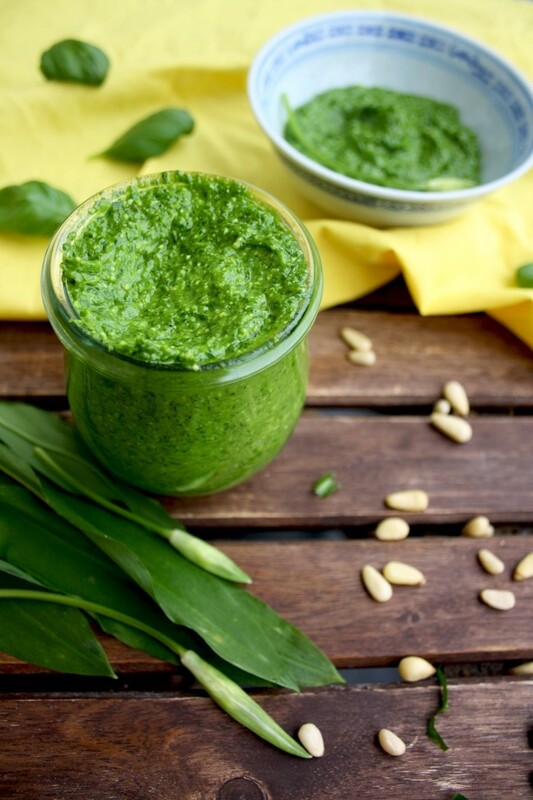 I opt for wild garlic pesto, which is incredibly delicious and also seasonally appropriate. 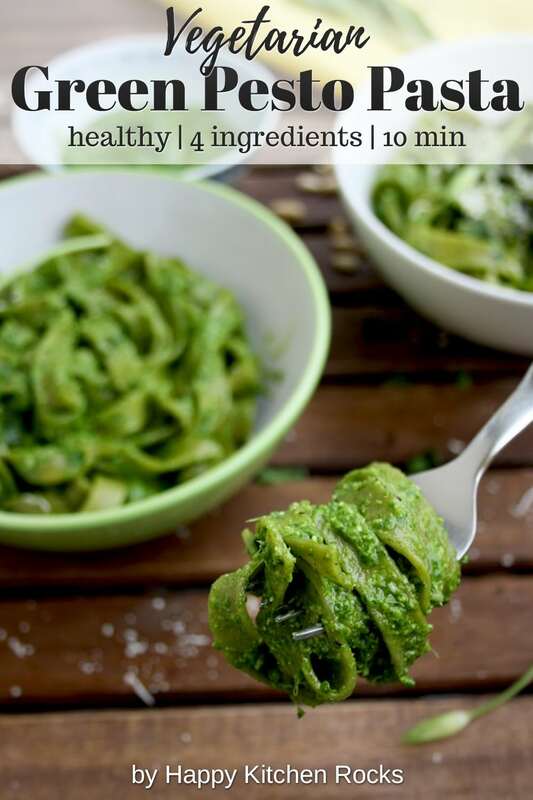 See the full recipe below and enjoy the green goodness of this simple pesto pasta! Boil pasta according to the instructions on the package. Drain and stir the wild garlic pesto and olive oil. Transfer to plates. Sprinkle with Parmesan cheese (if using), season with black pepper and salt. Garnish with chopped wild garlic. Enjoy! What is your favorite pasta? Leave a comment below!